Atwater Village is a Los Angeles community that lies between the Los Angeles River to the West and the City of Glendale to the north and east. 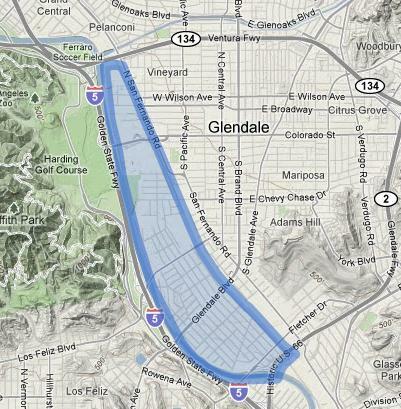 In addition, our neighborhood shares borders with the neighborhoods of Silver Lake to the South, Elysian Valley to the Southeast, Glassell Park to the Northeast, and Los Feliz and Griffith Park across the river to the West. Much of Atwater lies in the old river flood plain, which resulted in deep, fertile soil that local gardeners enjoy today. Courtney bought her first house in Atwater in 2003. A charming California bungalow on Glenmanor, it was her home until a Spanish fixer on Valleybrink lured her two blocks West. Never one to enjoy a long-distance move, her next purchase was a Spanish four-plex on Edenhurst, where she spent many happy years. Deeply rooted in the community, Courtney has dedicated the last decade of her life to promoting the neighborhood and preserving home values. (If you ever need advice on paint colors, a tough refi or the perfect spot for lunch, stop by and ask her!) Having witnessed the changes in Atwater over the last 10 years, Courtney is super excited to see what the next 10 will bring. "What I love most about Atwater is….everything. The bungalows, the tree-lined streets, the way that people actually look you in the eye when they say hello in passing. Village Bakery’s breakfast specials, Pot-ted's mid-century ceramics, 55 Degrees' tastings, Tacos Villa Corona's steak and potato burrito, and Sew LA’s dress-making classes. Most of all, I love my neighbors - diverse, interesting and engaged - they're what makes Atwater Village home." Kurt landed in LA in 2002 after an extended world tour with his brother. The result was the 2005 New York Times Best Seller, Honeymoon With My Brother. (If you ever need travel tips, stop by and ask him about it!) His first LA purchase was a crash pad in Silver Lake, sometimes referred to as the "All Male Youth Hostel". Post-travels, Kurt got back into real estate, joining forces with established LA agent Courtney. Working and selling in Atwater Village, Kurt found himself falling in love with the neighborhood. So when the opportunity to buy the former West Samoan Consulate on Madera came up, Kurt jumped at the chance. He spent the next year of his life restoring a property that sat vacant for over 20 years. Kurt moved to Atwater in 2009, and hasn't looked back. "What I love most about Atwater is….Sunday morning. The day starts with a stroll on down to Glendale Blvd for a cup of joe or juice, a bike ride along the LA River, a dip in my pool followed by fish tacos at the Farmers’ Market. All while interacting with the wonderful folks of Atwater." Courtney + Kurt Real Estate Team at Compass - Team Leaders: Courtney Smith DRE 01406768 and Kurt Wisner DRE 01431217. Compass is a licensed real estate broker (01991628) in the State of California and abides by Equal Housing Opportunity laws. All material presented herein is intended for informational purposes only. Information is compiled from sources deemed reliable but is subject to errors, omissions, changes in price, condition, sale, or withdraw without notice. To reach the Compass main office call 626.205.4040.